Dream vacation have always been the mantra of Sandals Resorts and the group's largest project may be it's most defining statement yet of opulence, luxury, and creativity in the Caribbean. 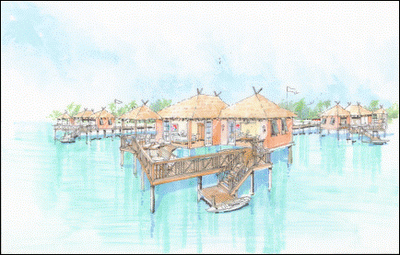 The theme is East meets West for the soon-to-be-constructed over-the-water bungalows at the Sandals Grande St. Lucian Spa & Beach Resort, which are inspired by the original style of the over-the-water hotel rooms first seen in French Polynesia in the 1960's and later, those in the Maldives, which represent some of the most iconic travel imagery in the world. The concept behind this project was to create an idyllic retreat at Sandals Grande St. Lucian, a Five Star Diamond Resort, in a setting that is exclusive, therapeutic and utterly romantic. 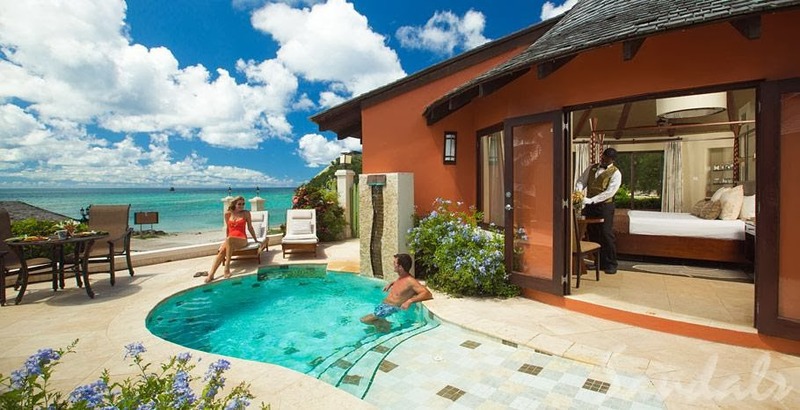 With more than 30 years of experience in the hospitality industry, Sandals' executives set out to make a statement in the Caribbean with a collection of over-the-water bungalows firmly rooted in the azure waters of the Caribbean Sea. 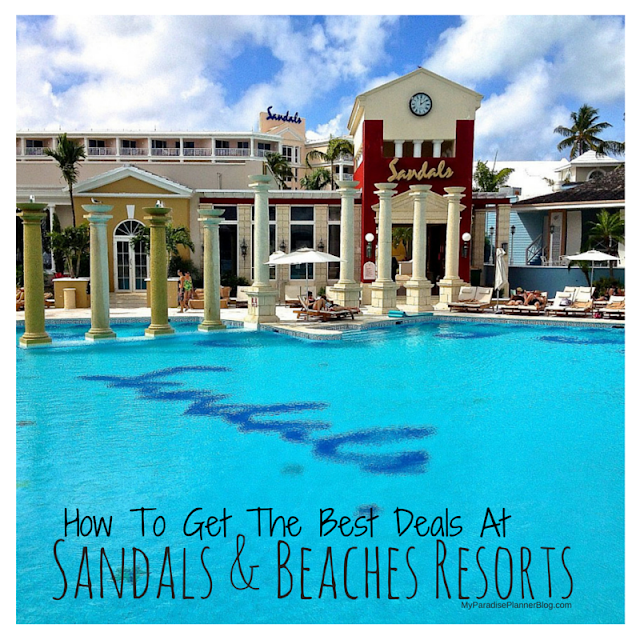 According to Adam Stewart, CEO of Sandals Resorts International, "We traveled to all four corners of the globe to see what others had done; then we went away and made ours stand above." When Senior Interior Designer Sarah Hartman set out to produce the look of the 16, 1300-square food over-the-water suites on the island of Saint Lucia, her main intention was to bring the feeling of outdoors in. "I want our guests to be able to feel like they are staying under the stars and hear the sounds of the lapping waves beneath them when they are laying in their bed," she said. 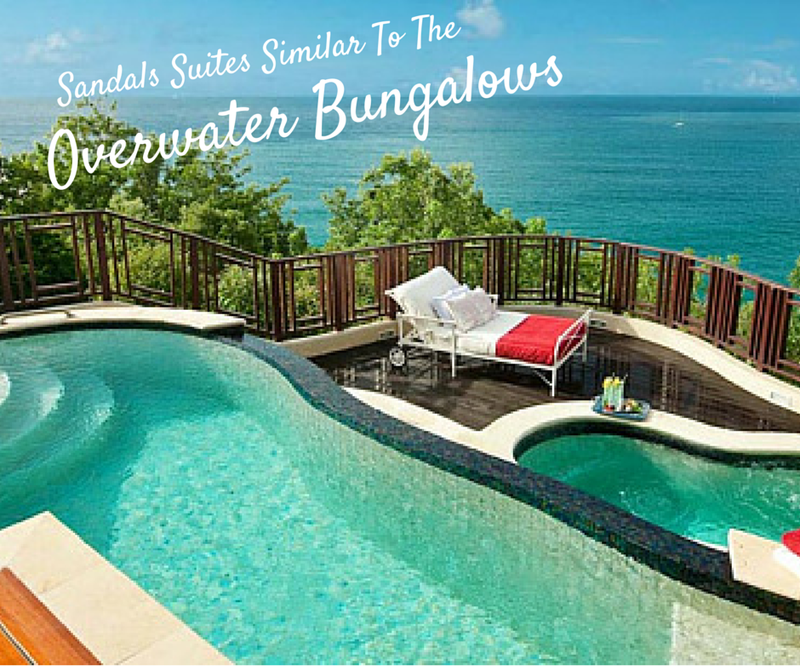 In keeping with Sandals' uniquely Caribbean style, the design team has opted for custom-fitted mahogany furnishings and stainless steel fixtures. Hartman achieved her goal of brining the environment to the interior of the suites by conceptualizing the use of natural materials such as glass, stone, and thatch, accented with warm shades of aqua, grey, silver, and blue. Each bathroom will offer and indoor/outdoor shower, pebble floors and a large soaking tub clad with teak and marble. Plush hammocks will line the patios, which will be decked with Guyanese greenheart timber. Additionally, the deck with have an exterior living room atop 50 square feet of glass floors, which will create the spectacular illusion of an indoor aquarium. All suites will come equipped with a private whirlpool with an infinity edge overlooking the ocean and 10 deluxe suites will have plunge pools, as well as other first class amenities such as butler service. The luxurious bungalows will rest seven feet above the Caribbean sea in one of Saint Lucia's calmest bays, and will be accessible by a pier. Guests can rest assured that these suites will be constructed from environmentally-friendly materials such as Envior Thatch and recycled glass. Senior Project Manager Mark Hardings adds, "These suites are being built in an area where there are no coral colonies, so the buildings will not have an impact on local fish populations or coral heads." Sandals Resorts International has plans to break ground with this landmark project in 2012, with the estimated construction time from 12 to 18 months. 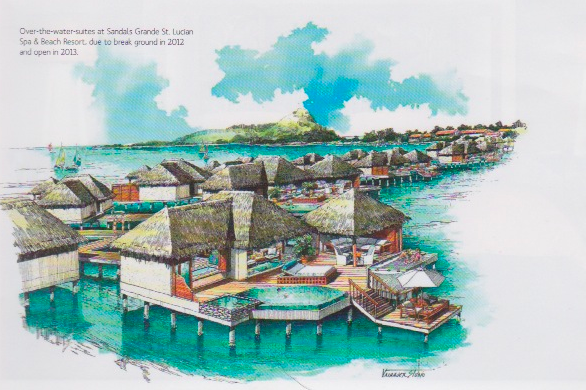 "These bungalows are going to add an unbelievable room category for Sandals, allowing Saint Lucia to stand out even more as an exclusive Caribbean destination, Hartman says.